Leslie Lillard of LLillard Designs is a graphic designer with a penchant for fresh flowers. Of course it's not always possible to obtain the real thing, so when she came across Japanese kusudama, Leslie recognized the folding art just might satisfy her craving for room brighteners. She began making flowers from a variety of papers and later opened her Etsy shop from which she sells bouquets, along with pretty origami note cards and boxes. Kusudama flowers clustered on top of a wedding shower or engagement gift in place of a bow would be a sure attention-getter. Perhaps the bride would carry them at her wedding rehearsal, or considering how elegant they look with ribbon bound stems, even at the wedding itself. 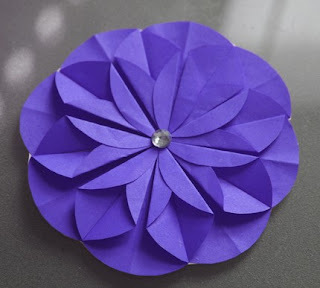 Composed of 3 inch x 3 inch squares of paper, the flowers mainly require time and patience to construct. Ask Leslie Lillard to make you a beautiful bouquet. LOVE the flowers! And I also really like those boxes. I am surprised you aren't in the middle of making dozens and dozens of these! I am so tempted to give them a try! They would be a lovely addition to my Easter tree! AND my Holiday tree! Oh and my Butterfly tree! I hope these aren't hard - I have talked myself into it! I really do love this technique. I am going to have to dive in an try it out. Thanks for sharing Ann...I continually find inspiration from your blog. These flowers are beautiful! It is amazing how elegant paper flowers can be. Thanks everyone for your enthusiasm; these flowers always seem to be real attention grabbers no matter where there's a post about them. Pam, you are right... I really need to get busy and make some myself!